Some of the coolest events I attend each year aren't beauty events (although those are pretty cool). Really, it's the holiday toy previews that tend to be the most fun. There are some fun toys out there, you guys. So, to kick off my 2016 holiday gift guides (they'll be lots of them over the next two weeks! ), I wanted to share a few of the best toys I spotted this year. Scoop them up now (that is, if you're not already too late!). Your little ones will thank you (or, well, Santa) later. Barbie Hello Dreamhouse: It seriously puts any regular ol' dollhouse or dreamhouse to shame. It's wifi-enabled, it plays different songs and sounds in each room, it responds to voice commands, and there's a working elevator. Can I move in? Furreal Friends Torch My Blazin Dragon: He makes noise, he moves, he responds to touch, and he breaths some (surprisingly realistic-looking) fiery mist. He also comes with a cute marshmallow on a stick that changes color when you "roast" it over the fire. He's totally adorable and not at all "girly," so little boys will love him, too. 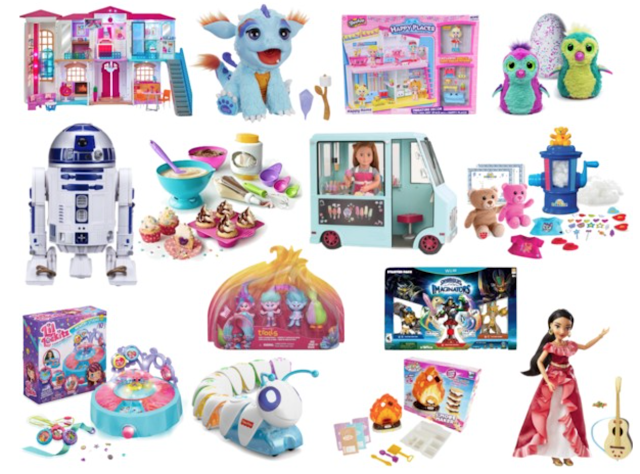 Shopkins Happy Places Happy Home Playset: Okay, so you already know about Shopkins, right? (They're those little plastic grocery-shaped figures that kids obsessively collect and trade.) Well, meet the new iteration. They're all shaped like pieces of furniture and various things found in a home. You collect them to try to fill the house. If you're going to buy Happy Places, this Happy Home itself is a good place to start. You can also get individual sets. Your kids will go nuts for them. Star Wars Smart R2-D2: It's like having your own robot...who happens to be the world's most loveable droid. He responds to your voice (and follows your commands), plays music, dances, recalls popular Star Wars characters, and more. So fun for any little Star Wars fan. Build-A-Bear Workshop Stuffing Station: I find this thing beyond adorable. It's a mini version of the "stuffing stations" found in Build-A-Bear stores, so it allows kids to stuff their own bears at home! It comes with supplies to stuff (and dress) two bears, but you can order more. It even comes with the little plastic hearts to stick inside. What kid wouldn't love this?? Lil Lockitz Memory Studio: This was one of my favorite toys that I saw this year. It's just so simple and fun. Using colored paper, glittery stones, charms, and more, your kid can make fun, one-of-a-kind necklaces, bracelets, and keychains in seconds. It's a fun, crafty, perfect rainy-day activity and the finished products are really cute. This Memory Studio is kind of the deluxe version. You can also get smaller packs like this one for just $5 to $10. Fisher Price Think & Learn Code-A-Piller: Designed to give kids (think preschoolers up to 8 years old or so) an early introduction to coding, here they'll learn to reconfigure the settings using problem solving and sequencing skills. Perfect for your budding little Mark Zuckerberg or Steve Jobs. Trolls Poppy's Fashion Frenzy: It's simple, but any little kid who loved the Trolls movie will love this. It's a set of four figures with lots and lots of hair to brush and style. What more do you need? Yummy Nummies Smore Maker: City kids can pretend they're camping with this easy, no-bake way to fake-make s'mores. There's no heat and no cooking (the included, light-up campfire is just for fun), but the s'mores are edible! Skylanders Imaginators: This is a new world to me, because this is not something my daughter is into and my son is still too young, but apparently Skylanders are hot right now and this is the thing to have. For the first time ever, kids can make their own Skylanders totally from scratch, choosing their powers, their name, their catchphrases, even their look (and it gets crazy detailed here. Apparently there are 20 different options for just ears alone). Disney Singing Elena of Avalor Doll: She sings, she comes with a cute little guitar, you can dress her up, and she's under $16. Your little girl will go nuts. I think I want the s'mores maker for myself! Ha! Seriously, though, doesn't that appeal to the kid in all of us? I used to love the Easy Bake Oven, too. I had NEVER heard of Hatchimals, but apparently they're impossible to find! Great list! We need an Elena too! I have never heard of any of these, ok except Hatchimals because apparently they are everywhere! My kids are still too young perhaps, but they haven't really asked for anything specific! An R2D2 robot? My kids would be in heaven! As for Hatchimals, I see people posting these on garage sale sites for like $300! Insane! Love this list & your Twitter feed btw. Can't wait to share this!